This class moves slowly, with modifications as needed. We will explore yoga poses in a way that makes them accessible for your body, whatever your body can do. 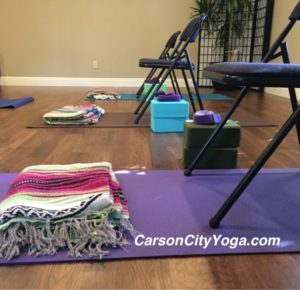 We will use props such as blocks, chairs, blankets, the wall, or any other tools that come in handy to allow you to experience the benefits of the yoga pose, even if that pose looks different for each person in the room. Chairs are an option for those who can not or do not want to get up and down off the floor, and mats are an option for those who prefer the floor. We will explore balance, strength, and flexibility, as well as the energetic and breath aspects of yoga, all of which will help us find a little more ease in our movements and our lives. This is a great class for seniors, people with arthritis, fibromyalgia, or other types of pain in their bodies, or anyone who thinks that their body cannot do yoga. This class is about finding the yoga that works best for your particular body and mind. Please Note: This class has a “Pay What You Can” option. While it is offered on the schedule at our regular rates, and you are welcome to use your class packages, we also recognize that those rates may not work for everyone. If our rates and packages do not work for you at this time, you may come to this class and pay what you can when you can. We never want money to be a reason not to do yoga. If this class is for you, please come! If you have any questions, please contact us.